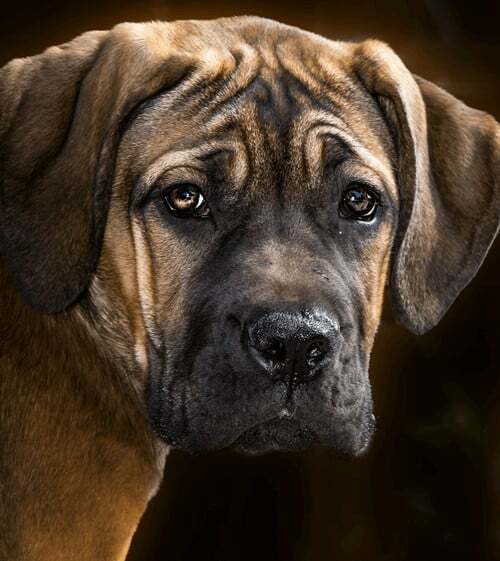 Full Circle Veterinary Care loves all the pets that come through our doors and we know that pet parents do their best to provide great homes for their pet family. Unfortunately, lots of circumstances can conspire to put many pets into rescues and shelters. The sad part is that it could be more than two years before a pet finds a home – that’s more than 730 days! Recent surveys conducted by Petfinder.com revealed some interesting statistics about the adoption rates of those animals considered “less adoptable.” A whopping 95 percent of rescues surveyed currently have pets they would define as “hard to adopt.” Thirty-three percent of shelters say they have had pets posted on the site 1 to 2 years, and 27 percent admit there have been pets waiting more than two years for their forever family. And while the typical pet spends about 12 weeks up on the site before finding a new home, the profiles of many pets with black coats, special needs pets, and senior pets spend nearly four times as long on the pet adoption site. That’s why, in 2009, Petfinder launched Adopt a Less Adoptable Pet Week, a celebration of old dogs, FIV cats, and other hard-to-place pets. An annual event held during the 3rd week of the month of September, this year’s Less Adoptable Pet Week takes place September 23rd – 29th, 2018. Many animal advocates know the real underdogs of the rescue world are black dogs and black cats. Whether it’s because of old wives’ tales or because they are more difficult to photograph, black-furred pets seem to get the raw end of the deal, making them less adoptable. “It’s not news to people who have been in animal welfare for a while that black cats and dogs are a little harder to place,” Los Angeles Animal Services General Manager Brenda Barnette tells TODAY.com. But Vice President of Shelter Research at the American Society for the Prevention of Cruelty to Animals (ASPCA), Dr. Emily Weiss, says two studies conducted by the organization show that color did not play a role in a person’s decision to adopt or not to adopt a pet from a shelter or rescue, that perhaps there is another reason behind the myth. “They might see that black dogs are staying around longer, but that might just be because there are more black dogs in the shelter,” Weiss explains, saying that black-colored animals may be more common. Adopters looking at a litter of seven pups, six of which are black and one of which is white, tend to choose the unique one. Yet many seasoned animal rescue workers say “Black Dog Syndrome” is quite real — and has serious consequences, too. “We continue to notice that black animals are euthanized first as shelter workers know the ‘turnover’ for black animals or their likelihood of being adopted is lower than animals with other colors or markings,” explains Erin Lamparter, who co-founded Lulu’s Locker Rescue, a Chicagoland-based rescue dedicated to finding homes for black animals. Lulu’s Locker also cares for another kind of less adoptable pet — cats with FIV, or Feline Immunodeficiency Virus. The condition operates much like HIV in humans; cats who contract the disease tend to have compromised immune systems due to a drop in white blood cells. While an FIV cat can have a regular life span, they do require a bit of extra medical attention to manage the illness. Still, cats and dogs with special needs can make wonderful pets. From cats with conditions like FIV to dogs with chronic illnesses or physical disabilities, these traditionally “less adoptable” animals have much to offer. But preconceived notions about special needs pets can put a unique pet with certain challenges on the hard-to-adopt list. Take deaf and partially blind Catahoula Leopard Dog mix, Eve, whom you first heard about in an early-August DogTime.com article. Eve’s first adopted family returned her to Marley’s Mutts Rescue because they were unsure of how to deal with their new puppy’s disabilities. “Let’s face it, disabilities in the canine world are very misunderstood,” explains Marley’s Mutts Executive Director, Zach Skow. Luckily, Eve found her perfect family, as she was eventually adopted alongside another special needs dog, blind Border Collie Dillon. But plenty of dogs and cats with disabilities or health conditions aren’t so lucky. Twelve percent of respondents to the Petfinder.com survey revealed that pets with medical needs or special considerations are the hardest to adopt out from their organizations. But according to shelter and rescue group members in the survey, the absolute hardest pets to place are older dogs and cats. While adorable puppies and kittens seem to have no problem finding new homes, senior pets often spend the longest amount of time at the shelter before being adopted — but many do not get adopted at all. Despite the fact many older dogs and cats are already house trained, know basic commands, and are much mellower than those young four-legged whippersnappers, many potential adopters seem uncertain about adding a senior pet to their family. Because of low adoption rates for senior pets, old dogs and cats have higher euthanasia rates or even live out their lives in a shelter kennel. Wondering how you can get involved in helping the less adoptable pets in your community? Volunteer for your local animal shelter to care for and promote the hard to place pets, those pets who can’t seem to catch a break and find the home they deserve. And if you’re thinking about bringing a new dog or cat home, consider adopting one of the “less adoptables” — it just might be the best decision you could make. FCVC vets and staff love all the pets we see. We would have more at home if we could find a place for them all. However, you can help. 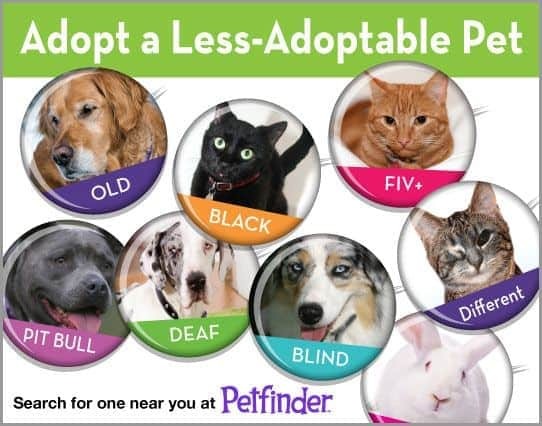 If you are thinking of a pet – consider one of the “Less Adoptables”. We will be happy to welcome them into your family with excellent preventive care and veterinary checkups. Give us a call if you have questions – 970-587-5140. Related articles that can help you locate “Less Adoptables” locally are the Adopt A Pet Search on our home page and Adopt A Cat (or Dog) and Adopting & How it Works.